Thank you for the compliment, just trying my best. Which games have those as the spellings? I've seen "Dormina" as the multi-target sleep spell in games as recent as SMT4, and have been considering changing that one. And it looks like the only other time the -rama or -laon spells appeared were in the GB Revelations game, though it was -rao instead. dia is the only spell commonly seen at the -rama level (diarama and mediarama) and megido is the only one commonly seen at -laon level (megidolaon), so i'm going off those. as for dormina, when i was entering demon data at the megamitensei wiki i put it in as "dorminal" and one of the admins changed it to "dorminar", though i'm not really sure why or if there's anything official for that; using "dormina" would probably be fine. Other then that, I haven't noticed anything else so far. True. Ok, I'll change them to "-rama". Yep, I just made it to that part of the game. There's actually a second half of the sentence missing: "to defend myself?" I forgot to put a newline at the end of that, and it affects dialogue that precedes a "Yes/No" prompt. I re-checked the MT1 script and it seems I left that out in 2 or 3 places, and have them fixed now. I will look over the MT2 script next to see if I missed any in there. Thank you for the report. That's major if it's causing the game to crash. I will look into it immediately. As for the Ginza one, I looked real quick at the place where it stores those floor numbers, and it seems like I made a typo for the number of tiles to use for "B5F". That will be an easy fix. *Edit: I have fixed the Core Shield bug and will upload a new build soon. I would just like to go over the MT2 script regarding the earlier "Yes/No" bug and verify that it won't appear again as well. **Further Edit: I left out the "Agirama Stone" and "Bufurama Stone" items with the spell re-name, and uploaded a new version in its place. The version number will remain the same, but if anyone downloaded it between 3:30 and 4:00, that is the only difference between the two patches. Thank you. Hopefully this game will be ready for release soon so that others waiting on the fence can finally play it without worry. *Edit: Still playing through the game, and re-discovered a bug I remember noticing when playing it so many years ago. When you get further into the game, like in MT1, sometimes you come across treasure chests that are already empty. This bug was in the original Super Famicom version, but I think it was fixed when it was re-released for the Wii Virtual Console. It seems like the game stores treasure chests according to map coordinates, and then flags each one as opened or unopened in RAM. But the way it calculates which flag to check or set is flawed, and will usually check against bytes that represent chests that you opened earlier in the game. I have a fix for this, and while looking at it, I also discovered that some chests are set to have randomized contents. Which would explain why I kept finding different things than what maps on the internet said they would contain. These random chests seem to look at a "step counter", which increments by one for every step you take, and loops from 255 back to 0. Loading a saved game doesn't seem to reset it, since it's saved with the file. But anyway, the chests seem to contain money when it's between 0 and 111, a monster when it's between 112 and 159, and Magnetite when it's between 160 and 255. 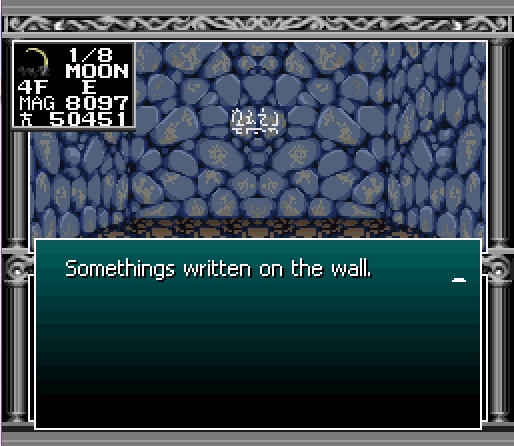 I guess as long as I'm spouting game trivia, the rooms where the game says "You look around..." are rolling a dice to see if you'll find an item. I haven't checked if the Luck stat can affect it, but basically you have a 1/16 chance to discover an item when it says that. And if you pass that check, it has a 1/16 chance of the item being a Soma, or else it's a Jewel. Same thing with the Terminals in MT2. When you teleport to a new location and it's displaying the "Transfer complete" message, there's a 1/256 chance it will display an easter egg message. Well, there's 2 messages, so if you pass the first roll, it's a 50/50 split of which message you get. Just putting this out there for anyone curious about the game. **2nd Update: I've finally finished playing through MT1 and modified some dialogue along the way, as well as cleaning up the ending which was slightly broken. I will also modify the "Error" graphic at the end into English, and then post an update. And of course it will include the "empty chest" fix noted above. Then it's on to testing MT2. I have a question: how are multiple hits from a weapon that can hit more than once decided? Is it with the Speed stat? Would you be able to post a save file so I can try it on my PC? That's strange that it would only happen for a specific monster. Damn, if I was an sculptor I would build you a statue. It saddens me I could not help with beta testing. I am still in MT1 in Bien because I could not play it before so I have not found anything to report. I am planning to gather all my notes, tools and source code that I used for this project and will put them on the Romhacking Aerie site along with the official release. It is my hope that it might prove useful to those that wish to localize the game in their own language or to serve as examples for people interested in learning how to program. Ahh, I wanted to ask if I could translate KMT to Spanish using your patch as a base! I digged around the patched rom to see what I could do and maybe learn something, but I didn't do anything serious because I wanted to wait for the finished translation to ask for permission. Heh, don't feel bad about it. Everyone else has been more than generous enough with all the feedback, so I think everything is covered. About translating to Spanish, sure, I don't mind at all! I do want to say that it would likely be much easier if you could wait for me to release my tools and notes. The utility I've written for modifying dialogue will save a lot of headaches for recalculating pointers and having to guess the width of your text. And I guess since you have looked at the insides of the translation, you can see that everything is out in the open and easily modified. All the graphics and text lists are at the end of the file, as I circumvented the compression routines for ease of use and modification. I also have that fix for the "Push L or B" map graphic that you mentioned on the other forum, and I'll just include it in the release. It should be located with the rest of the modified graphics. *Edit: Just putting this here in case people read from the end of the thread. The project is completed! And the front page has been updated with a link to the official release. A lot of the dialogue in MT2 has been updated, and all bugs should be fixed now. I have a second update pending that will contain the rest of the materials promised. You are going to be heralded as a legend in the Western MegaTen community. At least by me, that's for sure. Congratulations on the final release! 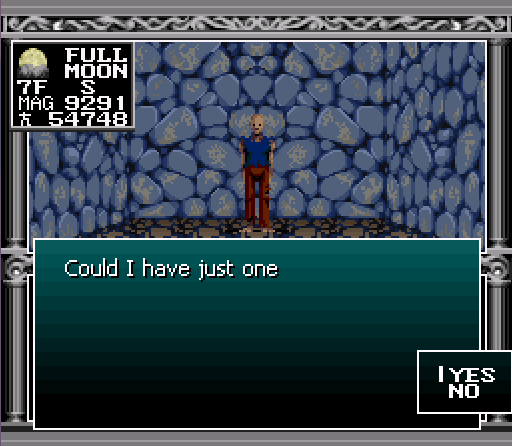 I've been playing Kyuuyaku Megami Tensei for the past few weeks using the beta patches and have been enjoying the game immensely, despite not being very good at it. I look forward to playing version 1.0 and I thank everyone involved for all their hard work! Thank you. Couldn't have done it without you. Heh, it was my pleasure. Hope you enjoy it! Alright, I'll look at it now. And thanks for getting the webpages activated. *Edit: I just submitted an entry in. Wow, they're really strict about how you enter stuff in. Thanks, glad to hear you've been enjoying it. I wish I could shake everyone's hands that helped out on it, it was a big help.